Let’s go through some basic terms before we get started. Filter: The traffic you want to manage, or more specifically the protocols you want to permit. For example, you may want to permit https traffic. Action: What you’re planning to do with the filter. While I said usually this will be a permit action, we do allow for other actions. Deny (Taboo) – Specific use case, probably during a migration from traditional networking to ACI. In this case you may specify to allow all traffic in a contract, but set up taboos to deny certain traffic. Redirect – This may be useful to send traffic from an EPG to a layer 4-7 device such as a firewall, load balancer, or IPS/IDS. Subject: contains a Filter, Action, and optional Label. Contract: contains one or more Subjects. As stated before a contract is placed between two EPGs as shown in the picture below. These contracts provide a basic stateless firewall between two EPGs. The question I get a lot is “what if I need stateful firewalls or more of a next generations firewall to do application traffic monitoring?” Well, you can do that, too, but you’ll need to use service graphs, which are beyond the scope of this article. Let’s move on to how we create contracts. We’ll start by creating filters, being the protocols we’re using to allow traffic between two EPGs. For this example we will create a filter for a contract that will go between a Database EPG and an Application EPG. In this example, the database EPG (DB-EPG) will be providing database services to the Application EPG (App-EPG), using port 1433 as a common MS SQL port. The configurations here will depend on what you’re trying to do. You may want to speak with your firewall administrator to see what is recommended. For this example I will use IP as my Ethertype. For my destination ports I’ll type in 1433. Notice I can use the pull down to select ports that are already available, but I don’t have to. I can enter anything I want, just be careful that you don’t hit TAB or it will change the value in this field. Now that we have the Filter created we can create a Contract in which to put it. Keep in mind, I’m assuming you already have two EPGs, in this case we’re using DB-EPG and App-EPG. For more information on creating EPGs check here. We can leave the two check boxes checked as they will allow for bidirectionality. However, if we only want to apply these filters unidirectionally from provider to consumer we can uncheck these. 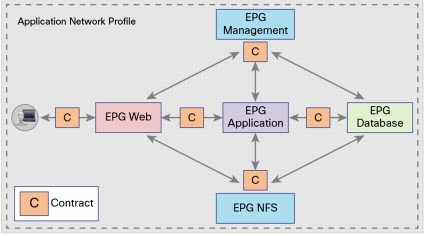 We have an App-EPG and a DB-EPG, we also have a contract created, so to complete our Application Network Profile, we need to attach our contract between the EPGs. Now if you click on the Application Profile that contains these to EPGs and Contract we see the topology where DB-EPG allows App-EPG to see traffic over port 1433. Of course this is how you do it all manually. As I’ve mentioned here this can all be done using REST APIs. Here is what the filter creation looks like in XML. You only need to input this in something like Postman to create the filter automatically (as well as have the correct URL path for your environment). 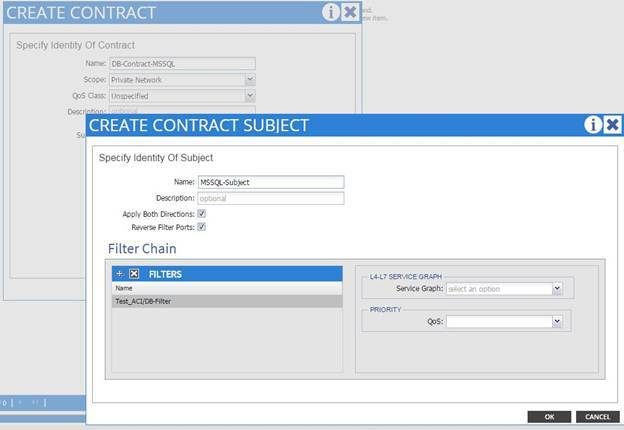 Here’s what the contract creation looks like after we’ve created the filter. Again, this will automatically let you do this. 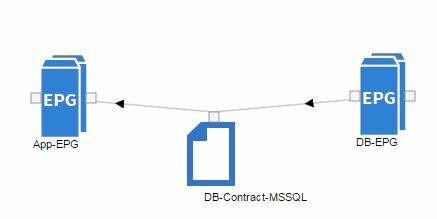 Of course, you can re-use the same object names, but it’s really easy to go through and find something like MSSQL-Contract and change that to Web-Contract, for example. Don’t be nervous if you’re confused by the REST API part of this article. That will make sense with time. Try to understand the first part where you’re going through the GUI. The GUI can do everything anything else can do and will help you understand the logic model as you’re moving along. If you have questions about any of this blog, please leave your comments below or reach out to me on Twitter @malhoit.